The other day I was in dire need of some macaroni and cheese. 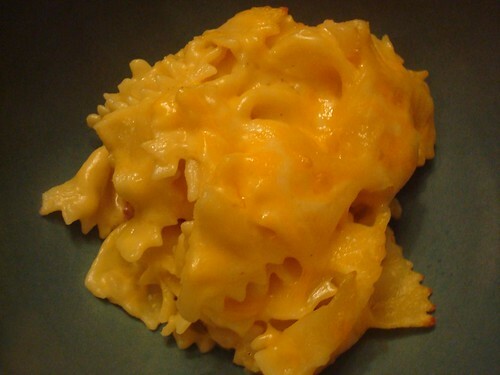 Real macaroni and cheese. In the past, my go-to solution has always been the frozen Stouffer's stuff because it is thick, creamy, and requires no cooking! So a good macaroni and cheese recipe is a real linchpin in my "quit buying frozen and prepared foods and instead make and freeze them yourself" mission. I found this recipe and went to work making myself some real honest to goodness macaroni and cheese. On a weeknight no less. 1. The butter and flour base for the sauce is a roux, essentially a way to thicken milk based sauces. The trick here is to pour the milk in very slowly, a little at a time, and stir like crazy. 3. This came together relatively quickly, I cooked the onions and garlic while the pasta boiled, drained the pasta, pulled together my sauce and popped the whole thing in the oven. I went from pulling stuff of the fridge to the dinner table in about 45 minutes.